Want to keep remaking the courts? Vote for your Senate GOP candidate. Heck, while you’re at it go ahead and pull the level for your GOP House candidate as well. 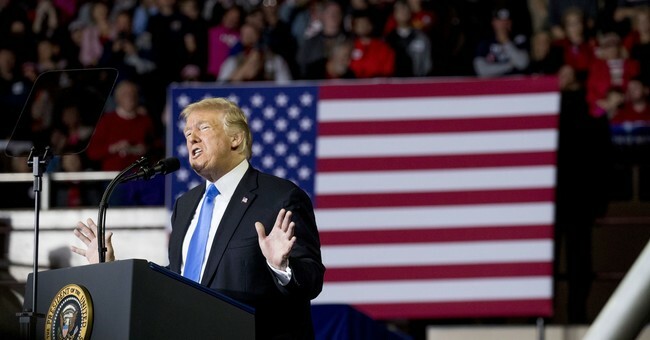 The black vote - While Trump’s approval rating among blacks likely isn’t quite the third that Rasmussen polled back in August, even CNN admits that the president is gaining some ground here. And while it may in reality only be a few percentage points, any vote for us and not for them is a vote freed from Democrats counting on that constituency, um, like they own it. The Hispanic vote - Democrats are supposed to get the Hispanic vote by birthright, right? Not so fast! Citing recent polling that showed Trump’s Hispanic approval at 41 percent, MSNBC national political correspondent Steve Kornacki called that demographic a “worry area” for Democrats. The economy, stupid - While there are certainly improvements that need to be made, especially with wage growth, America is experiencing an economic boom unlike anything that’s happened in decades. Love Trump or hate him, ultimately it’s feeding our families that should matter most, at least to normal people. For example, from listening to the liberal media you might think that Hispanics vote on one issue and one issue alone - immigration - and yet it’s actually the economy that concerns them the most, according to Kornacki. With unemployment at an all-time low and median income for Hispanic households actually on the rise, even Hispanics who hate Trump himself are less likely to want to upset the apple cart. And why should they? There you have it - seven reasons why the midterms might not go exactly as Democrats plan. Thanks in no small part to President Trump, things are certainly looking up for GOP candidates. Of course, nothing is in the bag, which is why your vote, and the vote of everyone you can bring along, is so absolutely critical.